Today is an exciting day! This morning we are hosting a live launch event, where we will unveil a surprise new version of our desktop browser, and a brand new smartphone browser named Opera Touch. Both browsers have a new search feature, that we call Instant Search, and they are designed to work together in a new seamless way we’ve named Flow. We gave this combined mobile, and desktop release the code-name R2. Following our Neon and Reborn releases, R2 is our third step in creating a new type of web browsers. We believe, that together Opera Touch, and the new Opera for PCs, will truly change the way you surf the web. Searching the web is something we all do numerous times every day, but when we started thinking about how we could make it better, we realized, that to make a new search you needed to stop whatever you were doing, and return to the address bar, or open a new tab. This often led to distractions, or fear of losing your current content. We wanted to develop a solution, that would be quicker and distraction-free - it’s a new way of searching we’re sure, that you’ll love. Instant Search opens a search box on top of the web site you are currently on, and lets you look something else up. The current web site is dimmed, while you are searching for something new. When you finish, just close Instant Search, and you’ll resume with the web site you were on. Distraction avoided! You can open Instant Search by pressing ALT + Space, or by clicking the new magnifying glass icon in your Opera sidebar. That’s not everything, that Instant Search does for you. A quarter of the respondents we asked in our US survey said, that they usually have several tabs open in their browser, and can’t seem to locate the exact one, they would like to be working with. Based on this research, and our own experiences, we decided to solve this common problem once and for all. In order to find the tab, that is tucked away out of sight, all you have to do is launch Instant Search (Alt + Space), and press the Tab key on your keyboard to transform your Instant Search into a tab search, and then type in some keywords related to your missing tab. You can also enter Tab Search directly by pressing the Ctrl + Space shortcut. Looking up new stuff online, and finding older tabs have never been easier. You might notice another new icon in Opera’s sidebar. This arrow-like button is Flow, our other new feature. Flow is actually pretty cool: it’s a thread for links, YouTube videos, and other files, that you want to save for later reference, or to share with your mobile device, but not with other people. Remember, we have already mentioned we’re also launching a new mobile browser for Android (and soon also for iOS): Opera Touch. 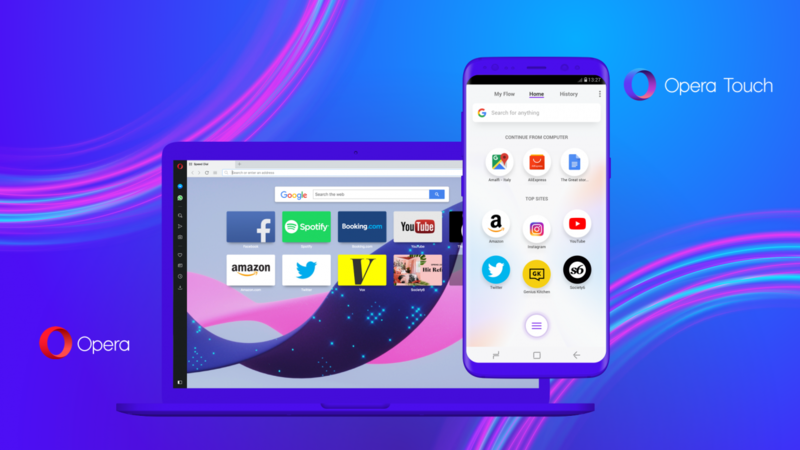 Opera Touch is designed to work together with your Opera desktop browser, regardless of your device manufacturer. Opening up to this experience actually requires a few steps from you, but bear with us and give it a try – you just might be blown away. To begin, go to your Google Play store, and download Opera Touch on your smartphone. 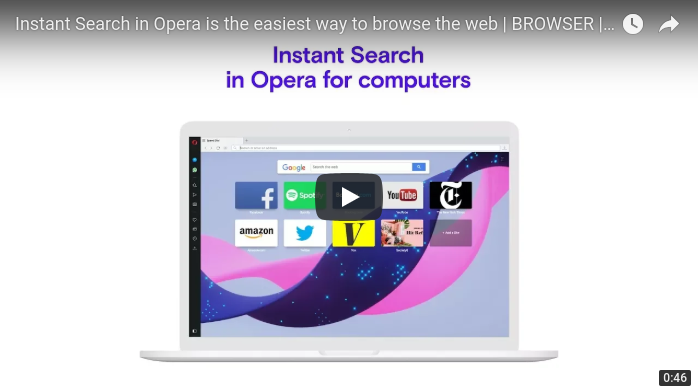 Come back to your Opera browser for desktop, open Flow (the arrow icon), and then scan the QR code displayed on your computer screen, with the new mobile app. That’s it, you’re all set. We have mentioned Opera Touch here, but this is a desktop blog, so we will keep it brief. 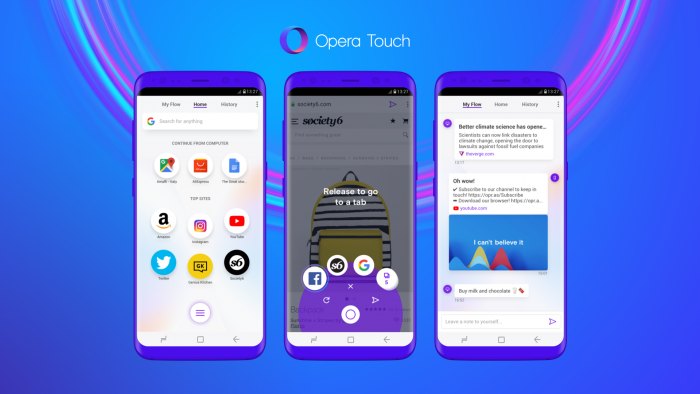 Opera Touch is a smartphone browser, designed to be used on the move, and with just one hand – even on large smartphones. You can read more about Opera Touch in our separate blog post. This is a lot of news coming from one browser company in a day. To sum it up: we have launched a new version of our Opera PC browser, and the brand new Opera Touch mobile browser. They are a perfect pair, and best experienced together. We hope you’ll enjoy our two new products, just as much as we did creating them. You can also read about all their features, and how they interact, as well as watch a recording of our live launch event here. Useless update quite frankly. Shoving Google down our throats on all ends... Opera Touch is too limited and only has Google. And all of the same features on desktop, Google only as well. Opera Touch is great look ahead most certainly - more common framework among clients. If I recall it was said today that Flow will be/could be (?) on forward to full sync(?). Not sure. Flow is interesting - and it wouldn't require much for to fork/combine it to a Notes -feature (no online dependent). Instant Search (not Rapid Search?) and Search -feature in general leaves much to desire. ...Opera seems to be improving. Tab Stacking would so great! Though I'm sure the devs have they're hands full on to-do. is there any chance someone will add a customizable search engine option? Otherwise there won't be an option for me to use Opera Touch but I'd love to. I had the same problem with Opera Mini and I don't understand why there is no possibility to change the default to a preferred search engine (despite an add-on). Or is my personal search engine to bad to show me a way out of my misery? - Crashes, when closing Instant Search. - F8, Ctrl+L or Cmd+L not selecting text in the address field, Ctrl+L , type URL + ENTER failed. - Crashes, when clicking the Flow icon in the pop-up window. @l33t4opera Thanks for fixing the address field issue so quickly, you guys rock!